“Just To Get A Rep” shifts gears from the episodes that came before it. There are no big plot twists or tragic murders, there aren’t any revelatory flashbacks, and no one fires a rocket launcher from a rooftop. At first I was ready to write it off as something of a filler episode, but by the end I really came to appreciate it as a quieter character study. The climax of the episode is Pop’s funeral, which brings together just about everyone in the main cast except Mariah (a notable absence given that the funeral of a beloved Harlem business owner seems like the perfect place for a politician to make an appearance). But before the service, Cottonmouth and Luke have to deal with the fallout of Luke breaking into Cottonmouth’s stash at Crispus Attucks. Thanks to the flashback interlude of “Step In The Arena,” I had actually forgotten that’s where the two left off (crazy how quickly you gloss over things in a binge-watch). But their antagonism in this episode winds up revealing a whole lot about both of their characters. For one thing, Cottonmouth clicks into place more strongly than he has before. Though confident and threatening on the surface, his bursts of childlike laughter betray his true nature: He’s basically an insecure teenager pretending to be tough. Mahershala Ali does a fantastic job of projecting both Cottonmouth’s put-on confidence and the more insecure person who lurks beneath the surface. He laughs a little too loud when he’s uncomfortable and lashes out a little too strongly when he wants to intimidate. He’s got the clothes and lifestyle of a Mafioso, but he doesn’t quite have the inner confidence, no matter how much he pretends to. Cottonmouth is also emerging—at least to me—as the most human of the villains in the Defenders universe. Though utterly captivating in their own rights, Kilgrave and Wilson Fisk exist on a more heightened plane of superhero villainy. And while Cottonmouth occasionally visits that heightened space as well, for the most part he just feels like a guy who made something out of nothing and is terrified of seeing it slip away. There’s no doubt he’s a villain—he murders an associate in cold blood for voicing an idea—but there’s something eminently relatable about his desperation to earn the approval of his mysterious backer, Diamondback. 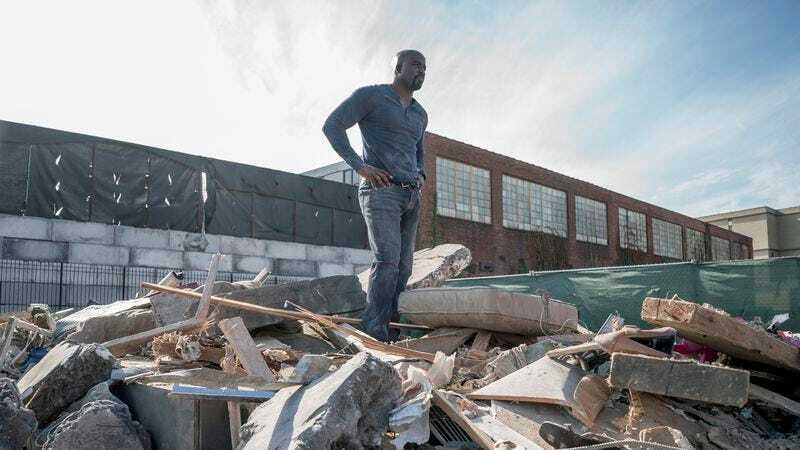 But it’s Luke Cage who winds up being the most fascinating character in “Just To Get A Rep,” in ways I didn’t quite appreciate until his eulogy at Pop’s funeral (which is beautifully delivered by Mike Colter). Superhero stories often like to pinpoint the exact moment their protagonists become heroes, like Peter Parker watching Uncle Ben die or Tony Stark constructing a suit in a cave in Afghanistan. But Luke Cage has allowed its leading man to have a far more gradual—and therefore far more realistic—journey to heroism. As we learned in the flashbacks last episode, Luke has always had a protective streak, even before he had powers. But so far his altruism has always been geared towards helping specific people he knows, rather than pledging to help people in the abstract. Just look at his immediate reaction to Pop’s death: He doesn’t set out to protect Harlem, he has a much more personal goal of punishing Pop’s killer and stealing enough money to reopen the barbershop. But in a classic bit of superhero irony, it’s Cottonmouth who ends up shaping Luke into a hero who can rival him. Hoping to turn Harlem against his former dishwasher, Cottonmouth orders his cronies to shake down locals for money and tell them Luke is to blame. As Luke admits in his eulogy, he initially helps these pissed off Harlem residents out of a selfish desire to clear his name. But along the way he begins to realize he doesn’t want to be a wash-up like former baseball player Eddie Axton, someone whose token of a once impressive life has to be hidden away lest he hawk it for cash. Instead Luke wants to be a hero like Pop, someone who fights everyday to make life better for the people of Harlem. He wants to leave behind a legacy that means something. Standout moment: Claire Temple is back! And, as always, every single moment with Rosario Dawson is a standout one. I particularly loved her chasing down/beating up her mugger, but Dawson is equally great when she’s just teasing her superstitious mom about a saltshaker. Claire’s still recovering from the insane events of Daredevil season two, but she’s well on her way towards becoming the superhero nurse the world needs and deserves. Also I enjoyed Bobby using his chessboard to figure out a seating arrangement for Pop’s many lady friends. And while my limited musical knowledge means I’m not able to discuss the show’s musical influences and performances as much as I’d like to, I really loved the Jidenna performance that opened this episode. Marvel Cinematic Universe connections: More references to Hammer weaponry, the Avengers, and “the incident” (a.k.a. the battle in New York). Plus Shades shows Cottonmouth footage of an exploding bullet made from Chitauri material that could very well be the only thing that can take down Luke. Also Claire tells her mom about Daredevil without mentioning him by name. Burning question: Okay so this really isn’t a question, but after the appearance of Sonja Sohn (a.k.a. Kima Greggs) as one of the detectives who warns Misty that her partner is under investigation, we have to talk about the insane number of Wire alumni on this show. Between Sohn, Frankie Faison, Michael Kostroff, and S. Robert Morgan, I think Luke Cage has officially surpassed The Walking Dead as go-to home for Wire alum. Broadening things out to the entire MCU you’ve also got Idris Elba in Thor, Wood Harris in Ant-Man, Clarke Peters in Jessica Jones, Dominic Lombardozzi in Daredevil, and Michael B. Jordan in Black Panther. I don’t know what it all means, but we should probably start wiretapping Kevin Feige’s phone to find out.